While a built-in entertainment center can truly be the envy of the entire neighborhood in terms of sweet home media setups, constructing one can be a daunting task for even the most seasoned home-improvement veteran. On the other hand, someone who has been a woodworker for a while shouldnt have any problem with this project equipped with a set of project plans and the standard shop tools. If you dont think you can handle a project as large as this one, then you might want to call a local professional cabinetmaker or finish carpenter. If youre handy with some tools and wood, however, then well talk about some of the more basic parts of the process that will have you enjoying theater-caliber entertainment right from the comfort of your very own living room. Arguably, the most important part of any process is the planning that goes into it. You need to make sure youve planned your cabinetry insanely carefully. Never begin a project like this until you have hashed out and gone over every single possible detail, even if you have to do so to the point that it starts to seem ridiculous. Its not ridiculous; its being professional. There are few things worse than getting deep into a project before you discover an oversight that literally sends you back to the drawing board. Build from a Woodworking Plan or Self-Designed? If you are the adventurous type and want to engineer your own signature design, then plan and sketch everything before you begin so you know exactly where everything will go. On the other hand, if you are working from an entertainment center plan, go over it at least two times to familiarize yourself with the process. Keep in mind that you may have to make some alterations to accommodate your media components and/or the living space you are working with. If this is the case in your situation, measure twice and then check carefully for any spots where these alterations might cascade down to affect other project components. Now youre ready to start measuring and cutting your wood. You should have a cut list detailing exactly what pieces you need, and what dimensions theyll all need to be. Do all your measuring and cutting at once, so you have everything ready before you begin assembling. During this portion of the project its important that youre still thinking ahead. Dont forget to cut holes for things like outlets and wires so you dont wind up blocking access to that precious power that your electronics will need to show your favorite movies in the first place. You can work from the top down as you do this, for the sake of being methodical, starting with the countertop, then the shelves, cabinet, and cubby below as you move down to the base. Next, do a preliminary sanding and then dry fit all the components and make any necessary adjustments. Some adjustments can be made after during your final assembly after the glue is cured. These might include things like through tenons that stick out a hair or dovetail joints that arent perfectly flush. Apply your glue of choice, get everything assembled, and set your clamps. Note that as you proceed with this step, everything has to be square as you clamp up. Because of this, the more complex your project is, the more important it is to choose a glue with a long open time. I recommend Titebond Liquid Hide Glue for a project like this because of its long open time and easy squeeze-out clean-up with plain water. Take care of any final adjustments as mentioned above. Do a final sanding. Next, you will be ready to apply final touches to your project with the trim and molding. Now apply your finish. Once that is done, you can finish up by installing any doors, drawers, etc, then you can move it into place and load up the electronics. 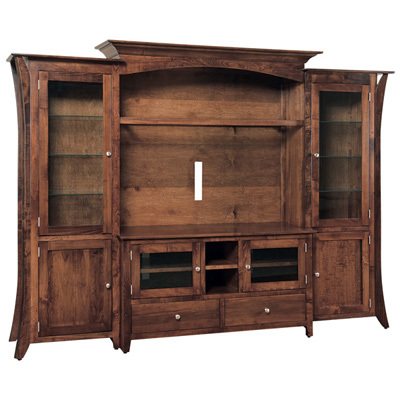 Its never been easier to build something like a built-in entertainment center, and if youre not confident with tools and building materials, then you can always call an outlet like Legends furniture to help you with what you need. Either way, its not hard to set yourself up with a great media fixture for you and your family. Have you found any tips and tricks that relate to custom furniture plans and projects? Feel free to share them with our other readers in the comment section below!